“Kedi” (2016 production, 2017 release). Director: Ceyda Torun. Web site. Trailer. The City of Istanbul is at the crossroads of the world. For centuries, the port city on the cusp of Europe and Asia has been a center of trade and trading ships, many of which kept cats to help control on-board rodent populations. When these vessels made port, many of their feline crew members disembarked and made themselves at home in this newly arrived destination. Cats from all over the world took to the streets, claiming them as their own, their ranks swelling ever since. And, given that the furry creatures performed the same function on land that they once did aboard their sailing ships, they were warmly welcomed by the locals. The fact that they were adorable likely helped, too. Through the centuries, street cats have made themselves home throughout the city, and residents have come to regard them as family, with virtually everyone taking part in helping to care for them without considering them pets. It’s now hard to imagine Istanbul without its pervasive feline influence. And that influence is considerable, affecting residents’ outlooks on such matters as care, compassion and even inter-species relationships, all of which they believe are readily transferable skills that can also be applied to interpersonal dealings. They have sincerely come to believe that cats can teach us as much about ourselves as they can teach us about them. Told largely through the eyes of seven of the city’s street cats and the people who see to their needs, audiences are treated to a panoramic tour of the Turkish city and its diverse neighborhoods, lively and engaging conversations with its colorful residents, and a wealth of adorable cat’s eye-view footage, much of which is guaranteed to prompt prolonged “awwwws” at regular intervals. The mix makes for entertaining viewing at virtually every turn. 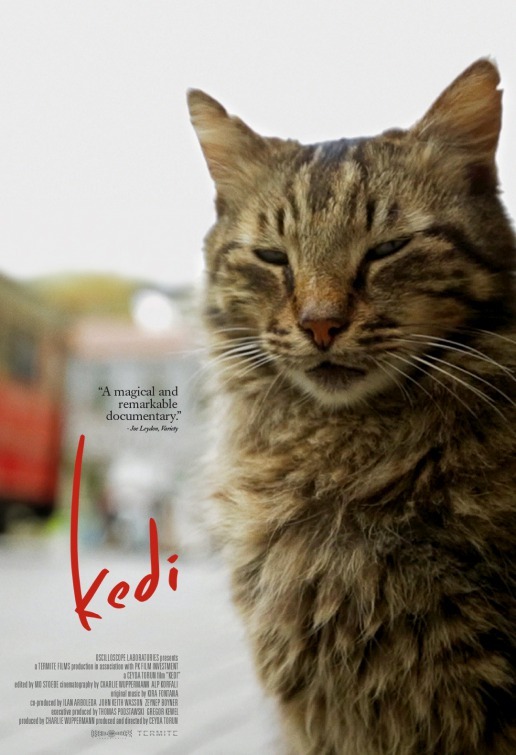 But “Kedi” is more than just a visually heartwarming feast. In fact, there are numerous subtexts running through the film that make it a surprisingly profound production. One might not readily associate metaphysical insights with a picture such as this, but their presence is there, even if subtly. In particular, the interactions between humans and cats clearly illustrate the inherent connectedness between us, one of the chief qualities that characterizes the conscious creation process, the means by which we manifest the reality we experience through the power of our thoughts, beliefs and intents. The bonds between care givers and care recipients are undeniable, demonstrating that the so-called separation we often adhere to is a mere illusion. With such a new understanding, we thus have an opportunity to shift the nature of our relationships with these creatures. It allows us to become aware of and appreciate our co-creative capabilities. It enables us to broaden our view of what it means to communicate, an observation that echoes the message of the recently released sci-fi thriller, “Arrival”. But, perhaps most importantly, it gives us a new perspective on the concept of compassion; the residents’ relationship with the cats draws out that capacity, one that we can employ not only in our dealings with them, but also in our interactions with one another. That’s a message whose ramifications have potential to extend far outside the waters of the Bosphorus. And, when we put the energy of our beliefs behind such notions, it’s amazing to think about what’s possible – all of which we can learn and put into practice simply by caring for cats. While it might be tempting to classify this documentary as little more than an extended cat video, “Kedi” delivers so much more through its gorgeous cinematography, gentle humor and insightful observations. Having seen this film in a jam-packed, 750-seat theater for a matinee showing, this release clearly proves there are audiences for content that don’t involve explosions or inane laughs. Feline lovers will no doubt adore this one the most, but those who appreciate good cinema, regardless of subject matter, will likely find much to enjoy here, too. In the end, this delightful film gives us pause (and paws) for reflection. And to think that all it takes is a little tuna, a little love and few gentle past on the head.